Are canary diamonds still in? The answer is . . . yes. Coloured diamonds and gemstones retain their popularity. In fact, they continue to gain popularity with new ideas for settings. One new idea for setting canary diamonds is to include other stones in the ring. It’s up to you whether you choose the canary diamond as the main stone with smaller stones as accents, whether you choose to accent another stone with smaller canary diamonds, or whether you choose a three stone setting with all of the stones of equal size, like Meghan Markle’s engagement ring. Although the stones of the royal engagement ring are all matched, they don’t have to be. Express your preference for canary diamonds by using one canary diamond as the centre stone with white diamonds or other gems as the side stones. Among other styles that mix stones are halo settings that encircle the main stone with pave accent stones, hidden haloes that tightly encircle the base of the main stone below the prongs of the setting, two-stone settings that mix stones of different sizes as well as colours, and smaller side accent stones with unexpected cuts, such as a triangle (trillium) cut or a pear-shaped cut. Cluster settings can mix several different coloured gemstones with canary diamonds. Again, canary diamonds can be the main stone or the accent stones. East-west settings position your canary diamond so that the design of the ring goes across the width of your finger instead of along the length of your finger, making it a very comfortable style to wear day-to-day. 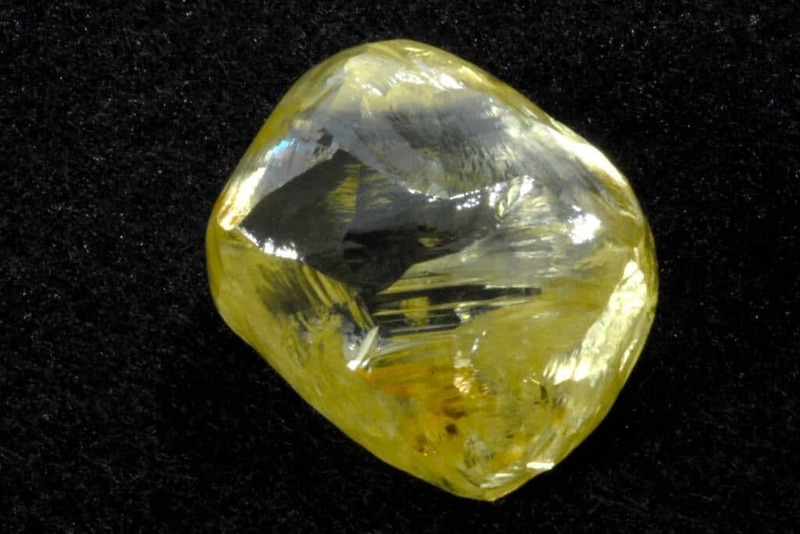 Canary diamonds and other stones can also be set at an unusual, skewed angle rather than in the more expected east-west or north-south orientation. Split shank rings contribute to the popular stacked ring look with two tow rings that split the shank that holds the stone between them so that the canary diamond appears suspended between them. Open rings have canary diamonds or other stones set at the open ends of the ring instead of forming a closed circle. Rose gold continues its popularity, and it is being paired with canary diamonds for a warm glow. For traditionalists, yellow gold also complements canary diamonds and achieves the same romantic golden glow. On the other hand, black rhodium offers a striking colour contrast to set off a canary diamond, and the look created could go sleekly bold and modern or delicately romantic. Unique, highly personal rings are a major trend whether the look is romantic, dramatic, sleek, or traditional. The cut of the ring makes a major contribution to the uniqueness of the ring. Trillion and pear cuts are not only popular for side stones but also for the main stone. Marquis, oval, and cushion cuts are also popular choices. The cushion cut is a softened version of the sharply edged square or rectangular princess cut. The style falls between the princess cut and the round cut. Sharp-edged geometric cuts like the previously mentioned trillion and princess cut as well as hexagonal cuts offer other stunning options for canary diamonds. Whatever the cut, setting, metal, or style you choose to compliment your canary diamond, the most important factor in your choice shouldn’t be what is in or out, because what’s in and what’s out constantly ebbs and flows. The most important factor behind your choices should be what is most meaningful and symbolic to you.